I should not be up right now. It’s exactly 10:37 pm and I need to be up at 7 am tomorrow morning to attend the annual Walk for Life hosted by the local Crisis Pregnancy Center. Also I will be seeing (and reviewing) the movie “Pan” right after the event. Oh, and then I have LifeTeen. Anywho, as I announced on the CGB Facebook page, this review is the first of five movie reviews I will be posting this weekend, so here we go. This is my review of The Martian! Based on the book by Andy Weir, The Martian tells the story of an astronaut named Mark Watney, who ends up stranded on the planet Mars after a fierce storm interrupts his crew’s routine mission. Back on Earth, all hope is lost until NASA is contacted by the lost astronaut. From there, it’s a race against time to bring him home. You NEED to see this movie in 3D because the visuals are fantastic! The 3D makes the storm sequence in the film’s opening feel realistic, as if you are actually stuck in an interrgalatic storm. Between this, Interstellar and Gravity, it’s safe to say that Hollywood has come a long way in its portrayal of outer space. The cinematography captures the vastness of space and the scorched atmospherics of Mars. The movie makes good use of the red and orange color palate that dominates Mars. Matt Damon succeeds in carrying a good portion of the film on his own. He is alone for the majority of the movie, after all, and he commands the audience’s attention with Mark’s optimism and unbreakable spirit. My favorite moment is when he straight-up says, “I’m not gonna die.” This moment alone establishes him as an active agent of his own destiny rather than being a passive victim of circumstance. Also, I really do like how he has to solve his problems using his knowledge of botany. Yes, it is true; this movie is surprisingly relaxed and even funny. The comedic moments are brought to us by Matt Damon’s performance. He never overplays it. He uses humor as a coping mechanism to help relieve the stress of his predicament. I don’t think I’ve seen this character arch done correctly. A lot of movies tend to exaggerate a witty character to the point where their banter is their only defining trait. However, the Martian handles this arch with tact and grace, recognizing that there is more to the survivalistic Mark than his quips. To put it simply, everything right with The Martian is Mark Watney himself, which is a very good thing since the main character is always the most important ingredient of any story. The NASA scenes are a chore to sit through, mainly because in the second act, we spend a 25 minute period of NASA officials negotiate Mark’s rescue. This is the only part of the film that had me checking my phone for the time. To be fair, it’s much better than Fant4stic Four, which had me checking my phone six times. Still, a movie shouldn’t lag. If a film needs to slow down for story development, character growth or whatever it needs to do, make sure that whatever is happening is engaging. Believe it or not, watching a group of people in suits chit-chat is not that rivieting. For me, the biggest flaw is that the film took a sinfully small amount of time to develop the family dynamic of Mark’s crew. I could hardly connect with the crew that left him behind on Mars. The scenes with Mark’s crew are few and far between, making it impossible to care for them as three-dimensional characters. When the movie cuts to Earth, we get more scenes of NASA negotiations than of the crew. I understand that when adapting a book into a movie, the filmmakers have to make some changes and sacrifices, but at the very least make me believe that this crew is motivated not by the script, but by a bond with their lost crewmate to go out and rescue him. My hands are starting to hurt, but luckily this movie was not painful at all. 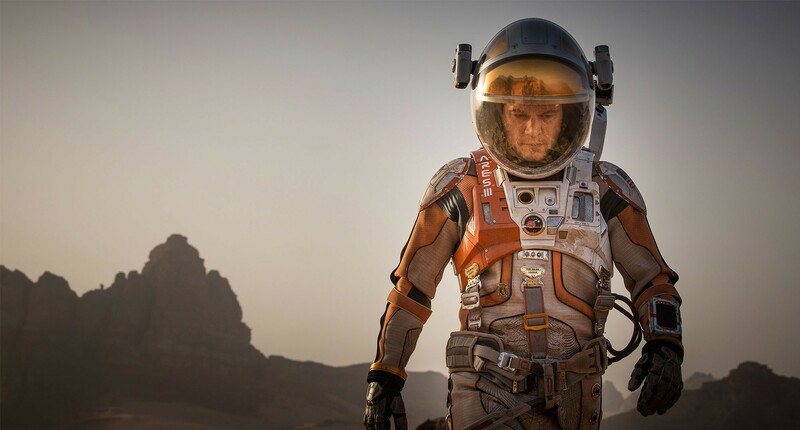 In fact, if you love space, NASA and all things science, you will love The Martian. Matt Damon’s charm and commitment to the role is what brings this movie home. Great article and an awesome movie! NASA has just announced that they will put humans on mars within 15 years! What do you think about that?